We are about a third of the way through the lockout-shortened, 48 game NHL season, and things are starting to settle into place. There have been many surprising performances so far, both good and poor. And while it may be too early to look at award candidates, here are some insights into the NHL thus far. Thomas Vanek has been on fire this season. 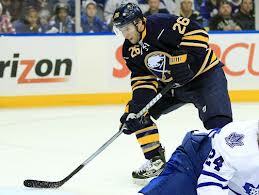 He currently leads the NHL with 12 goals and 25 points for the underperforming Buffalo Sabres this season. Vanek has three games with two goals or more this season, and is scoring about once every four shots he takes. If the 29-year-old forward can continue this torrid scoring pace, he is likely to win the Hart Memorial Trophy as the NHL’s Most Valuable Player. Last season was a breakout year for 25-year-old Claude Giroux; he scored 28 goals and finished third in the NHL with 93 points. He performed especially well in the playoffs for the Flyers, leading the team to an upset of the Pittsburgh Penguins and scoring 17 points in 10 games. This season, Giroux was named as the new Flyers captain, and expectations were incredibly high, but Giroux has struggled offensively. In 17 games, Giroux has just 13 points and a meager 5 goals. Philadelphia has struggled along with Giroux, currently sitting in 10th place in the Eastern Conference. We saw a glimpse of Anderson’s ability in the Senators’ first round playoff series with the New York Rangers last season, and the 29-year-old American has continued to impress. Anderson leads the NHL in save percentage (.948) and is second in goals-allowed-average (1.61). He also has 7 wins this season, including two shutouts, and his excellent play has the Senators currently in a playoff spot. It looks like the Kings are the latest victims of the famous “Stanley Cup hangover”. After hosting the Cup after a miraculous playoff run last June, the Kings have struggled to play good hockey this season. Playoff MVP Jonathan Quick has a save percentage under .900 (.895), and is a far cry from the stonewall he was in the playoffs last year. The Kings are 27th (fourth worst) in the league in goals scored (only 2.2 per game), and currently sit in second to last place in the Western Conference. Last season, the Ducks had just 80 points, and missed the playoffs for the second time in three years. Now, the Ducks have turned their team around, currently sitting atop the Pacific Division with 25 points. The main reason for their success has been goaltender Viktor Fasth, who has not lost a decision this season. In 9 games, Fasth is 8-0-0 with a .933 save percentage and a 1.76 goals-against average. With veteran leaders like Teemu Selanne, Ryan Getzlaf, and former MVP Corey Perry, the Ducks have all the tools to succeed in the NHL this year.